These are some fantastic knitted liquorice allsorts I bought this week on Ebay (UK Ebay). I was hoping they would be here before I sent off my candy swap, so I could include some of them, but they came later so I wll have to keep them all! We are up visiting Grannie and Grandpa in North Wales, So I will post when we get back home. 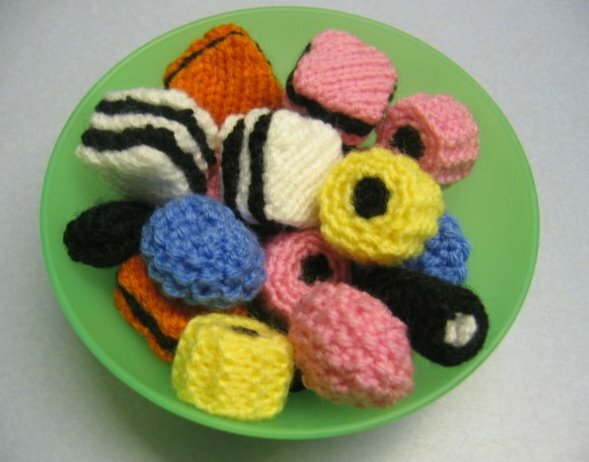 They are so sweet!Excuse the pun.One of my favs liquorice allsorts!